Jim's jewelry, keepsake and decorative boxes. 1 Margaret's Jewelry Box This box was built from plans in Popular Woodworking's book "Box by Box" by Jim Stack. The box was called "lookin' good". 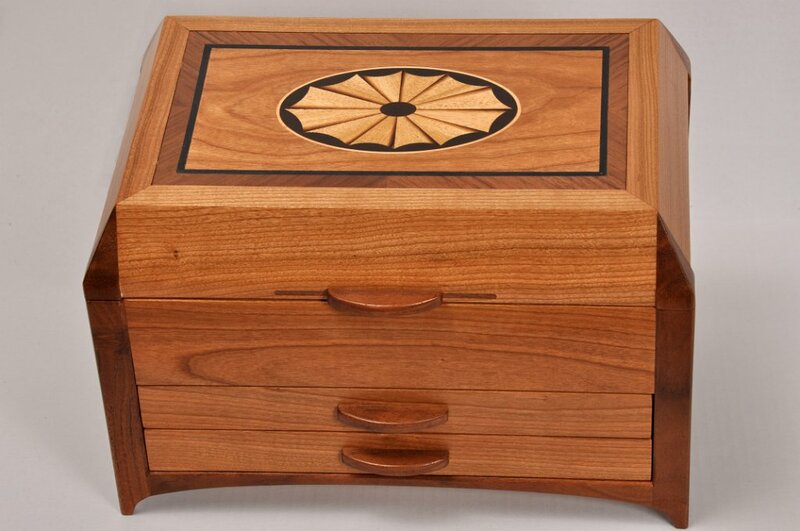 The box is made from quarter-sawn white oak, wenge, and padauk. The inlay band on the top was purchased and was not part of the plans. The finish is several coats of shellac. I gave this box to my sister Margaret. 2 Inside Margaret's Box This photo shows the inside of Margaret's Jewelry Box. I used green felt for lining and white oak for the dividers. 3 Krista's Graduation Box This box was adapted from the "Cherry Jewelry Chest" in Doug Stowe's "Simply Beautiful Boxes". Instead of Cherry, this one is made from African Mahogany. The top is book matched Mahogany burl veneer. This box was made specifically for my grand-niece, Krista, who was graduating from high-school. I still treasure the thank you note with a picture of her holding the box. 4 Inside Krista's Box I used a deep red felt for the lining. The same Mahogany was used for the dividers. 5 Walnut Chest of Drawers This box was also adapted from a box in Doug Stowe's "Simply Beautiful Boxes", that he called “Ash Chest of Drawers”. This one, of course, is figured Walnut not Ash. I made two of these boxes; the first was given to a very good friend. My wife was so sad to see it go that I made another one just for her. 6 Tina's Pin Chest This is my version of “The Pin Chest and Earring Cabinet” in Doug Stowe's "Creating Beautiful Boxes With Inlay Techniques". I used quarter-sawn Ash and Walnut as was used in the original. My younger daughter, Tina, uses this for her rather large collection of Disney pins. 7 Inside the pin chest You can see the large collection of Disney pins that Tina has placed inside. 8 Men's Jewelry Box This box was also adapted from the “Men’s Jewelry Box” in Doug Stowe's "Simply Beautiful Boxes". Instead of white Oak with a checkerboard inlay, this one is Walnut inlaid with Zebrano. The finish is Enduro lacquer which I sprayed on. 9 Inside Men's Jewelry Box The inside of the Men's Jewelry Box features a sliding tray also made from the same Walnut. 10 Maple Chest of Drawers This box was also adapted from the “Tribute to American Linden” in Doug Stowe's "Simply Beautiful Boxes". Instead of American Linden (aka Basswood), this one is curly Maple. Instead of carving the top, I used Maple burl veneer on a core of MDF. The finish is sprayed satin Enduro lacquer. 11 Inside Maple Chest of Drawers As you can see, this box features three drawers and a spacious upper compartment. The Maple burl in the lid shows prominently in this photo. 12 Treasure Chest This is “treasure this” from Popular Woodworking's book "Box by Box" by Jim Stack. My version is Mahogany that I dyed to add ‘age’. I built the coopered top first and then sized the width of the box to the top. Otherwise calculating the correct cutting angle for the top segments and then actually setting the saw to that angle is just too difficult. 13 Simple Lidded Box This is my version of “The Koa Box“ in Doug Stowe's "Creating Beautiful Boxes With Inlay Techniques". I didn’t have Koa, so I used quarter-sawn Ash. I made the inlay using the techniques shown in the book. 14 Inside Simple Lidded Box The inside of this small box has a free-form divider to create three smaller compartments. 15 Triangle Box No. 1 This is one of my versions of “The Triangle Box“ from Doug Stowe's "Creating Beautiful Boxes With Inlay Techniques". This is Cherry inlaid with Walnut. 16 Triangle Box No. 2 This is another version of “The Triangle Box“ from Doug Stowe's "Creating Beautiful Boxes With Inlay Techniques". This one uses Brazilian Walnut inlaid with spalted Maple. 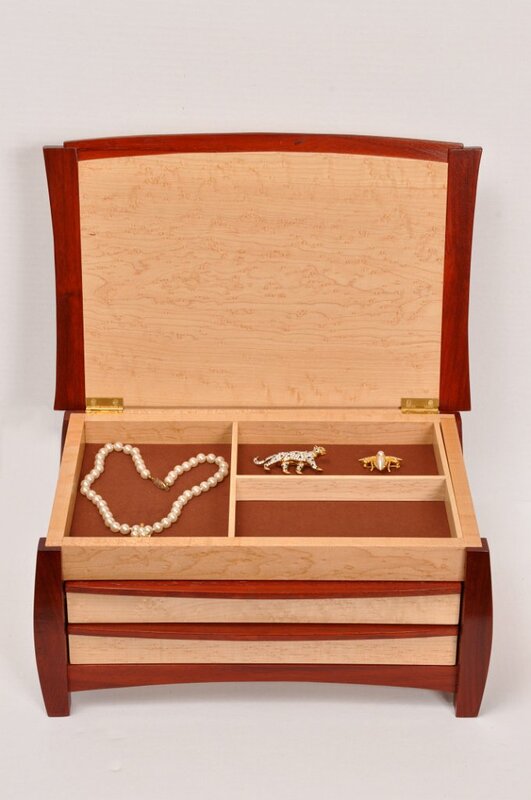 17 Gloria's Birthday Chest This is another version of the "Cherry Jewelry Chest" in Doug Stowe's "Simply Beautiful Boxes". This one is made from figured Quina. I made this specially for the 90th birthday of Gloria, the widow of one of my good friends also a woodworker who died in 2001. This box is even more gorgeous when seen in person. 18 Inside Gloria's Birthday Chest I used a purple micro-velvet to line this box. 19 Judi's Christmas Box This is my version of the “Jewelry Box with Hand-cut Dovetails“ from Doug Stowe's "Creating Beautiful Boxes With Inlay Techniques". I didn’t cut the dovetails by hand. I used a single Walnut board for this box. The inlay is birds-eye Maple veneer banded with black-dyed veneer. I made this as Christmas gift for my wife’s good friend Judi. 20 Marquetry Tray Not a box, but this is my very first marquetry project. I learned the technique at the 2011 fall seminar that was put on by the San Diego Fine Woodworking Association. The wood is primarily Cherry. 21 Marquetry Pen Box When my daughter needed a presentation box for a custom made pen and pencil set, “The Pen Box“ from Doug Stowe's "Creating Beautiful Boxes With Inlay Techniques" seemed like a good place to start. I also figured this would be a good place to practice my marquetry skills. 22 The Lonesome Pine The lid was made using the "packet cutting" marquetry technique. The box itself is made from Flame Birch with splines of Purpleheart. Six different veneer pieces were used. 23 The Lonesome Pine - Interior This is the inside of the Lonesome Pine. 24 Lonesome Pine Redux This is another version of the Lonesome Pine. This one is Mahogany. One of the characteristics of the packet cutting marquetry is that you get several copies of each piece. I used the "leftover" pieces to make this version. 25 The Pagoda Box This is the “Four-Drawer Jewelry Chest “ from the Dec/Jan 2012 issue of Woodcraft Magazine. I call it the “Pagoda Box” because the shape reminds me of that Asian structure. The legs and top are Claro Walnut. The drawer fronts are birds eye Maple. 26 Cherry-Walnut with Inlay I picked up "400 Wood Boxes" at the Rockler store. 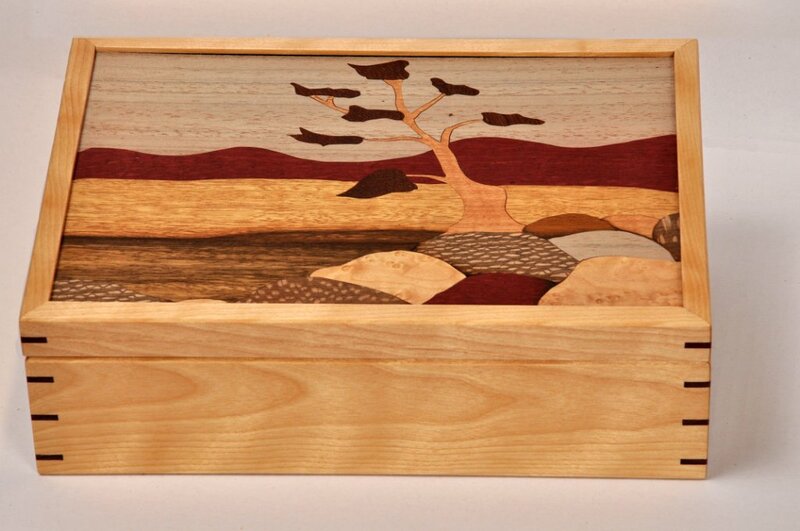 This is my version of the Dalbergia Garden Jewelry Box by Al Ladd from that book. I made the top using marquetry techniques learned at a seminar given by Paul Schürch. The box is Cherry with Walnut legs and handles. 27 The Monticello Box I call this box the “Monticello” because it was made based on a picture of a box I saw in an old catalog from “The Jefferson Monticello” organization. I can’t be sure it is an accurate reproduction because I was not able to get dimensions because this box is no longer in their catalog. The top is book matched walnut burl. I consider this to be one of my best pieces. 28 Mahogany with Maple This box also comes from "400 Wood Boxes". This is my adaptation of the Mahogany Moah by Jeffery B. Schwarm. It is made from Mahogany and birds-eye Maple. The top is bookmatched Mahogany burl veneer on an MDF core. 29 Gem of a Jewelry Box This is the “a gem of a jewelry box” that appeared in the October 2006 issue of WOOD Magazine. The original used Maple and Wenge, but I couldn’t find enough Wenge. I used birds-eye Maple and Padauk in my version. This is one of my wife’s favorites. 30 Inside the "Gem" The inside reveals two drawers and a spacious upper compartment capped by a gorgeous lid of birds eye Maple. 31 Tambour Box This is my version of the Tambour-Topped Box from the April 2011 issue of Woodworker's Journal. It was designed by Sandor Nagyszalanczy. I used Brazilian Walnut for my version. 32 Tambour Box - Opened Pulling out the drawer causes the tambour lid to roll back. I lined the drawer with real leather. It just felt like the right thing to do. 33 Secret Compartment Box This is my version of the “Secret-Compartment Jewelry Box” that appeared in the September 2004 issue of WOOD Magazine. The base is Walnut, and main box and lid are from a beautiful board I found at the Rockler store. I cannot remember the name of that wood, so I guess it will be a mystery forever. 34 Secret Revealed This photo shows how the box lifts off the base to reveal the “secret-compartment”. 35 Asian-Style Ornamental Box This is my version of the Ornamental Box by John Mendez from "400 Wood Boxes". This was my first experience using a product known as Inlace. I used birds-eye Maple and Padauk for the body. The top is Cherry with Inlace inlay. 36 Keepsake Box This is the “Keepsake box with contemporary flair” that appeared in the September 2002 issue of WOOD Magazine. I used birds-eye Maple and Bubinga. 37 Spider Box This is my adaptation of the Spider Box by Tam J. Crawford from "400 Wood Boxes". I used Koa and Bubinga instead of Teak and Cocobolo used in the original. 40 Grandma's Recipe Box Grandma's Recipe Box is Lacewood with a curly Maple lid. 41 Recipe Box - Inside The box was sized to hold those 3x5 card recipes that Grandma collects. 42 Cantilevered Jewelry Box This is the “Cantilevered Jewelry Box” that appeared in the Dec/Jan 2012 issue of WOOD Magazine. The original used curly Maple and Becote, but I couldn’t find Becote. I used curly Maple and Bubinga in my version. 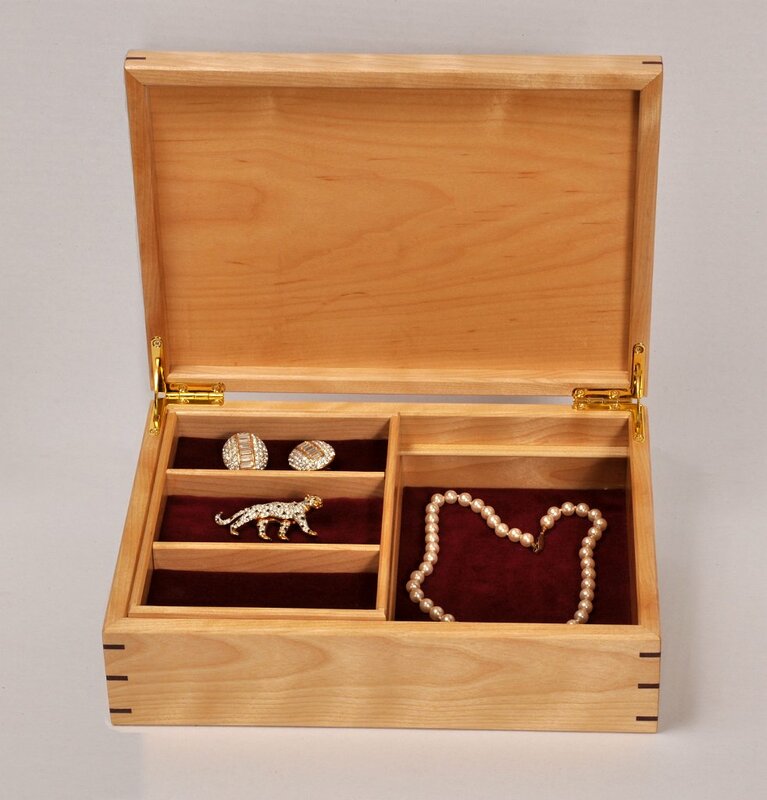 43 Cantilevered Jewelry Box - Open The drawer slides open from either end with a gentle push. 44 Music Box This is the "Wedding Ring Music Box" in Doug Stowe's "Simply Beautiful Boxes". Instead of Elm, I used Maple for the box, and birds-eye Maple and Walnut for the inlay. The tune is “Wind Beneath my Wings”. 45 Music Box - Inside This shows the music movement while displaying some ear rings. 46 Reaching Up I made this box specifically to enter into the Design in Wood Exhibition at the San Diego County Fair. A very special piece of Claro Walnut that I'd been saving for just such a project was used for the front and rear. The legs are also Claro Walnut, while the box sides and handles are birdseye maple. 47 Reaching Up - Drawer Detail This photo shows the drawer detail. One large dovetail attaches the birds eye Maple drawer sides to the Walnut fronts. 48 Tatooine Landscape This is my adaptation of Gary Upton's "Jewelry Chest 1994" from "400 Wood Boxes". My grandson James, who is a big Star Wars buff, thought it looked like one of the suns of Tatooine. Sounded like a good name to me! The front is Walnut from Bell Forest Products, the ends are Quina (left over from Gloria's Birthday box) and the lid is Bubinga, Walnut, Movingui, Satinwood and Cocobolo. 49 Floating Jewelry Cabinet - Interior The inside is lined with micro-velvet. As you can see, the lid pattern goes all the way through. 50 Silverware Chest This is a silverware chest that I made for my wife. We used to have a china hutch with a drawer for the silverware, but we replaced it with a larger unit without drawers. This was supposed to go IN the new hutch on a shelf, but my wife says it's too pretty to hide. The top is Walnut burl, and the sides are from a single piece of Claro Walnut. 51 Inside the silverware chest This is the inside of the chest. I used my CNC router to make the holder for the knives and the divider for the forks and spoons. 52 Wooden Magnolia I have started to challenge myself a little more. Getting a near perfect fit on a lid for a non-square box has its challenges. The marquetry is supposed to be a magnolia. What do you think? 53 Brandi's Breadbox My daughter's best buddy, Brandi, couldn't find a bread box that she liked. When I showed her the photo from Woodsmith magazine, she was excited. Instead of Oak, she chose Mahogany. When she saw the finished project, she was more than excited. I'm glad I wasn't standing too close. 54 Brandi's Breadbox - Inside This is the inside of the breadbox. The maple cutting board slides out from under. 55 Line and Berry #1 This is my first attempt at doing a "Line and Berry" inlay. The DVD from Glen Huey provided the technique, and the cover photo on a Lee Valley catalog provided the inspiration for the pattern. The wood is a piece of ribbon mahogany from Cook Woods in Oregon. 56 Line and Berry #1 - Interior Red Micro-velvet provides a cushy place to place jewelry and other valuable "stuff". This is the first box where I chose to install a lock; more for decoration than security. 57 His & Her Wedding Box This is my adaptation of the "His 'n' Her Box" by Mark Rehmar from the book "400 Wood Boxes". My nephew and his wife were renewing their wedding vows after nearly 25 years and I made this jewelry box as a special memento of the occasion. The box is Bubinga and Bubinga burl; the corner splines are Ebony. 58 His & Her Wedding Box - Inside This shows the inside of the His & Her Jewelry box. I used dark green micro-velvet to line the interior. One of the sliding trays has a ring holder. I'll let the happy couple decide who gets to use that tray. 59 The Dolphin Box Our family friend, Karen, loves Dolphins. She is a diver, a sailor, and has decorated her home with a Dolphin Theme. So I made this box for her as a Christmas present. I used dyed veneers in white, black and dark blue. The box itself is curly maple. By the way, she is also a photographer. She did my daughter's wedding and she also took many of the photos you see in this "Box Gallery". 60 Sun Tiger The design was inspired by a box done by Andrew Costine that I saw in the book "400 Wood Boxes". The wood is African Movingui and Bolivian Rosewood. The figure on the Movingui is extraordinary and exhibits a chatoyance that can only be seen in person. My 6 year old granddaughter came up with the name for this box. 61 Sun Tiger - Interior This is another photo that shows the top and the interior of the drawers which are lined with Micro-velvet. The box is approximately 15 inches tall, 12 inches wide and 8 inches deep. 62 Marblewood Jewelry Box This box is another of my adaptations of "Lucy's Jewelry Box" from Doug Stowe's "Simply Beautiful Boxes". I used a single piece of Marblewood with Walnut accents. The center inlay, which also serves as a handle to open the box, is Birds Eye Maple. 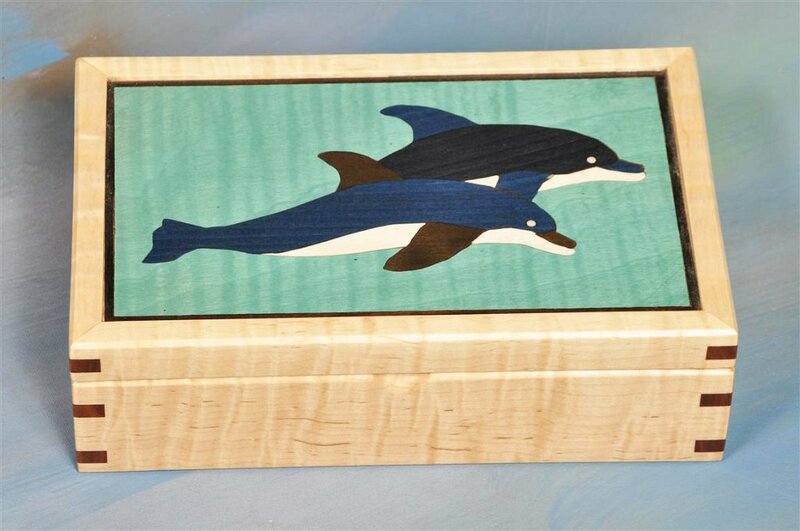 I've made several versions of this style box as gifts for relatives, but failed to get pictures. 63 Marblewood Box - Interior The Marblewood box with the lid open. I used dark green micro-velvet to line the interior of the box. 64 Line And Berry Chest Popular Woodworking magazine ran an article by Glenn Huey in which he did a reproduction of a chest originally crafted in circa 1750. This is my adaptation. It is 2/3 the size of the one in the article. I added additional line and berry inlay to the lid. My version also has handles on the sides as an enhancement. 65 Line And Berry Chest - Side View This view shows the side handles that I added. The handles and drawer pulls are antique brass all from Lee Valley. The inside of the chest is lined with aromatic cedar. 66 Purple Magnolia This box is my own design. The box itself is Bubinga. The lid banding is from Rockler. The splines and legs are Purple Heart. The Magnolia on the top was carved using my CNC Shark. I purposely omitted a lid handle so as to not break the flow of the grain pattern. 67 Floating Jewelry Cabinet Floating Jewelry Cabinet - This was my Entry into the 2014 San Diego Fair and uses Walnut Burl and spectacular curly maple on the sides and top (see next photo). 68 Floating Jewelry Cabinet - Side View This shows the beautiful maple used on the sides and top. This won the 2nd place President's Trophy in 2014. 69 Rebecca's Treasure Chest This is another adaptation of “treasure this” from Popular Woodworking's book "Box by Box" by Jim Stack My good friend and neighbor built a shop in his garage and is learning to make boxes. We decided to make these for our young grand kids. The one in this photo is for my nearly 7 year old granddaughter. The front is made by making a sandwich of Birds Eye Maple veneer, a 1/4 inch piece of Purple Heart, and a piece of Maple; and then machining the "sandwich" to 5/8 inch thick. The rest of the box is solid Birds Eye maple. The front of each box is then personalized with the recipient's name. We chose solid brass hardware through out. The box measures 16w x 6d x 9h. 70 Rebecca's Treasure Chest The inside has a sliding tray that can be partially seen in the foreground. Each box has a personalized message inside. My wish is that this box will be with her until she, too, is a grandmother. 71 Elena's Music Box A marine stationed at Camp Pendelton, the marine base about 45 miles up Interstate 5, had a company make a custom music movement with his friend's favorite song. He commissioned me to make suitable box to hold this movement, and also to provide some storage for jewelry and such. He wanted purple since that was her favorite color and he wanted her name on the front and this particular Native American motif on the lid. I madw the box from Walnut, with Purpleheart for the handles and slip feathers, and Purpleheart and ebony veneer for the marquetry top. I never found out how she liked it. 72 Elena's Music Box - Open The inside of the box, shown here, shows the Native American motif a little better. We couldn't find a micro-velvet in a purple that went well with Purpleheart, so we chose black. 73 Tineo Jewelry Box Tineo is the wood used for this box. The wooden hinges provide a bold, rustic look. The base of the box can be removed allowing access to a hidden compartment. 74 You can see how the wooden hinges cause this box to open in an unusual way providing easy access to the interior. 75 Burst of Sunshine My first box done entirely by CNC. The pattern is from the www.vectric.com website and was developed by Michael Tyler in 2011. I chose a pice of Canary Wood that had some marvelous grain pattern. I really like how this turned out. The next photo shows the inside. This box won a 4th place in the 2017 Design in Wood competition. 76 Burst of Sunshine - Interior This is the interior of the Paradise Box and show the unique grain of the section used in the lid. One six foot board supplied the material for this box. 77 Rose Front Necklace Cabinet I designed this cabinet specifically to hold necklaces. Behind wach door are hooks to hold them. The large drawer can take those necklaces that don't hang well, such as pearls. 78 Rose Front Necklace Cabinet - Open This photo shows the interior of one side. You can see the wooden pegs on the inside of the door for necklaces. 79 17th Centrury Spice Cabinet This replica of a 17th century spice cabinet highlights a line & berry pattern inlaid in a beautiful piece of walnut. The legs were quite a challenge, but with some work on the bandsaw and a couple router bits, they came out pretty nice. 80 17th Centrury Spice Cabinet - Interior The interior has nine drawers. The wide drawers have interior dividers. The three center drawers are not full depth and hide a "secret" compartment behind them. 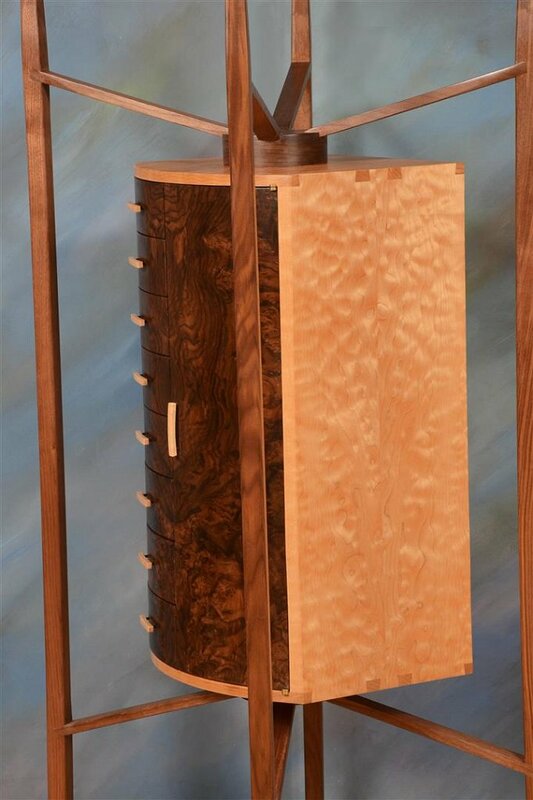 81 Sycamore Jewelry Caninet This large jewelry chest was made from walnut and English Sycamore veneer. The legs, handles, hinge mortises, and much of the interior details were made using my CNC machine. 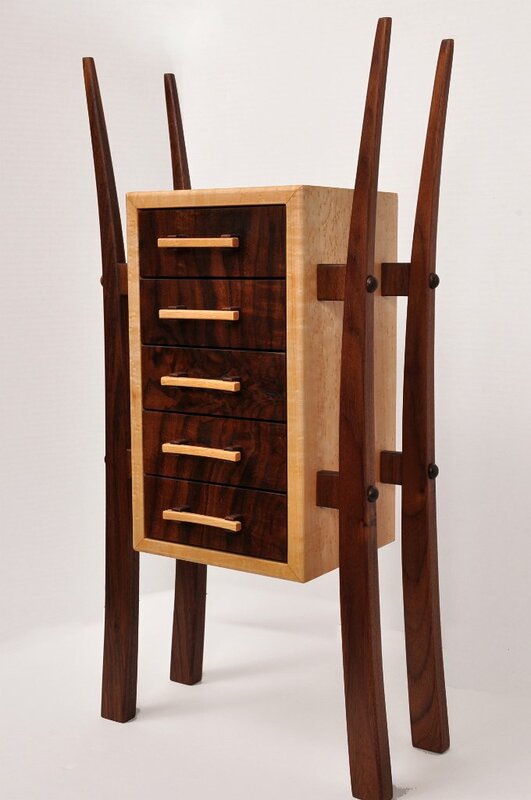 This piece won both a 4th place and "Master Woodworker Trophy" in the 2015 Design in Wood competition. 82 Sycamore Jewelry Caninet - Interior This is the inside of the jewelry chest. 83 Patty's Music Box My adaptation of the Music Box from Dennis Zongker's book (Tauton Press). The top is marquetry and the box features segmented legs that I turned on the lathe. It's surprising what can be made from pieces of plywood! Yes, the core of this box is baltic birch plywood. The veneer is Maple Burl; the trim is Flame Birch. Checkout the inside in the next photo. 84 Patty's Music Box - Interior In this photo, the music box movement is shown. Patty chose "Jupiter", from Gustav Holst's Planet Suite. as the center piece of her box. . As you can see the inside lid has the same marquetry pattern as the outside but with Bloodwood veneer for the violins. 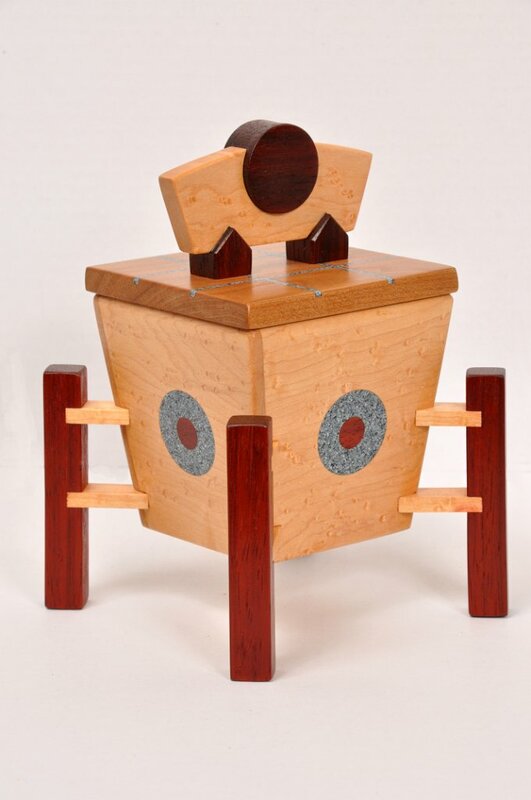 This music box won a 4th place in the 2015 Design in Wood competition. 85 Audrey's Keepsakes This Asian Inspired Box is made from Bamboo with some walnut trim. The lid is an Ash Burl veneer panel frames with more bamboo. I made this for my sister as a birthday gift. 86 Tina's Pins My daughter, Tina, has amassed a very large collection of pins, many from Disneyland, but also from numerous other sources. She needed more space to store these, and so I built this chest. The wood is Padauk and the carvings were done on my CNC machine. 87 Decorated 3-drawer Chest This box is a small version of a walnut box that appeared in one of the woodworking magazines. The original was plain, and in my opinion, cried out for some decoration. I added some inlay banding and marquetry to the top, and some line and berry that wraps around the back and both sides (not shown). The hardest part of this box is gluing the dovetails. Because they are proud, you have to be meticulously careful not to get glue on the exposed surfaces. It would be extremely difficult to remove squeeze out. 88 Cigar Basket This is a humidor with a marquetry "basket weave" lid; hence the name. This is a merge of two articles that appeared in a WOOD magazine issue. 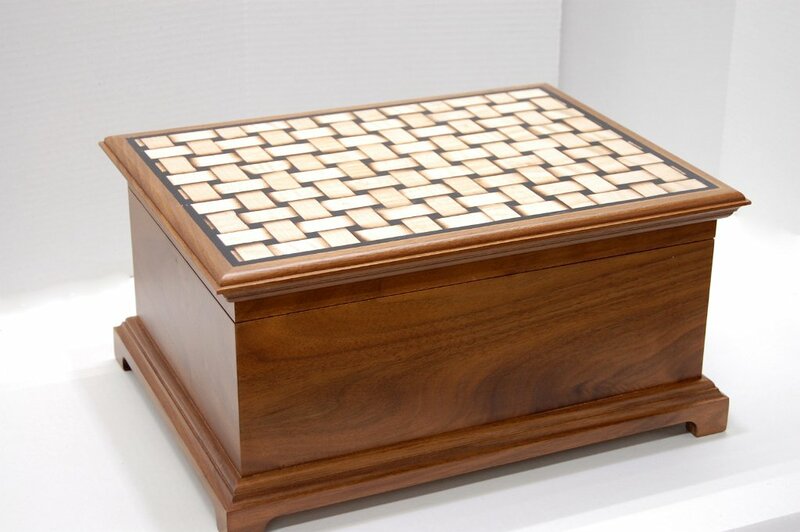 I used the article that explained how weave pattern could be created with clever sand shading of the marquetry pieces to make a "new" lid for the humidor project described in the second article. This box won 'honorable mention' in the 2016 Design in Wood competition. 89 Cigar Basket - Open Here is the inside of the humidor. The lining is Spanish Cedar. The cedar is not glued. 90 California Tansu This chest I called "California Tansu". It is over 2 feet wide and made from Bubinga and Bubinga veneer. Notice the 4-way book match on the front. The knobs and handles were made on my CNC machine. 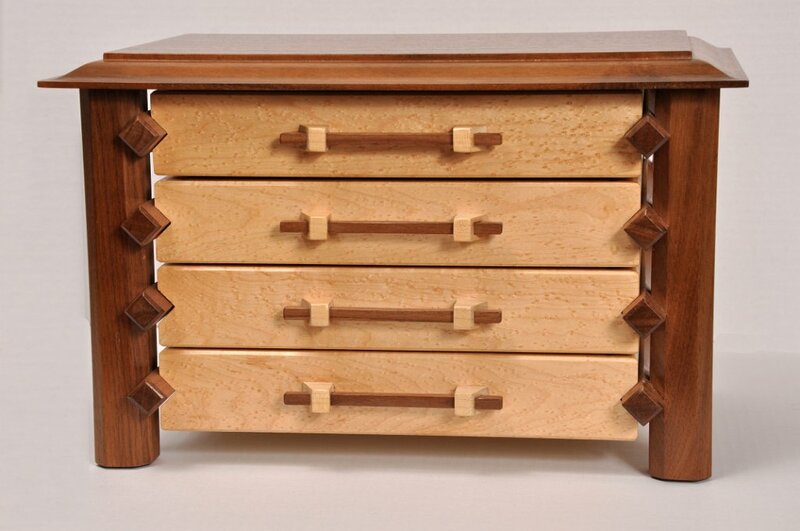 This chest won two awards in the 2016 Design in Wood competition - "honorable mention" from the San Diego Fair and "Excellence in Joinery" from Woodworker's Journal magazine. It also appeared in the December 2016 issue of that magazine. 91 Visiting Birds This jewelry chest was designed to be hung on a wall, with the option to be set on a dresser or table. The chest carcase is solid Cherry. The front is primarily Cherry veneer applied over doors made from bent-lamination of thin plywood. The knobs were made on my CNC machine. This won a 3rd place in the 2017 Design in Wood competition. 92 Visiting Birds - Open This photo shows the interior of "Visiting Birds". The pull-outs have 10 pegs each for hanging necklesses. 93 Cherry Box w/Hidden Compartment When the SDFWA asked me to be the unstructor for a box-making class, I came up with this, I thought, simple box. Simple mitered corners with walnut slip feathers and raised panel lid. It would take 5, maybe five, sessions to make. That was deemed too complex. It's back to the drawing board for a more class-suitable box. 94 Cherry Box showing Hidden Compartment The carcass of the box is inset into a base made from walnut. Rare earth magnets hold the parts together so the hidden compartment is less likely to be accidently discovered. 95 Cherry Box w/Hidden Compartment (lid open) The Cherry Box w/Hidden Compartment also has a slider for jewelry or such. The nice figure on the cherry panel used for the lid shows well in this photo. 96 Raintree and Bubinga Box I banged this box out in two days, Making the legs was the most time consuming because I had to make a jig to do the legs. Look closely and you'll see that the outside surface of the legs is not parallel to the box sides, but flare outward. This might be a good candidate for the box-making class.